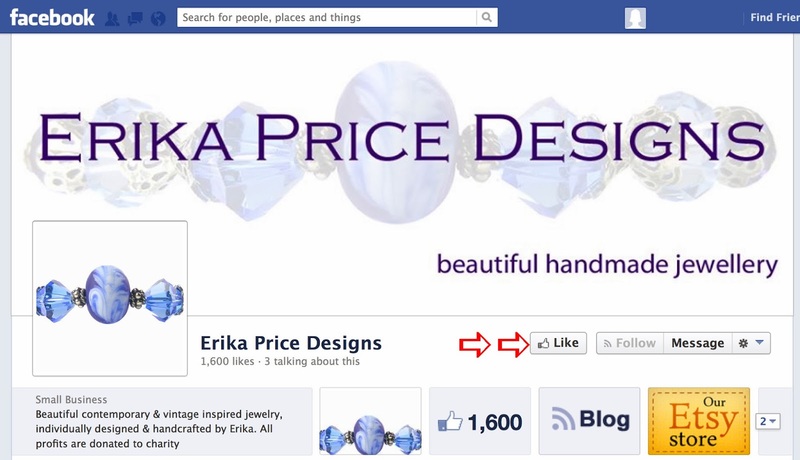 Erika Price Handcrafted Artisan Jewellery: Tuesday Tips - Getting Facebook Updates? Tuesday Tips - Getting Facebook Updates? Figure 2: Click "Get Notifications" to make sure you ... "get notifications"! Mystery solved! At least that explains why I've not been getting my friends updates. But, of course, this also means you are probably not getting any updates from me in your Newsfeed either! Are you losing out on info that you'd actually like to know about? As well as chatting and posting Wordless Wednesday and Skywatch Friday, I also post on Facebook when I list new jewellery items in my shops, and when I hold special offers and promotions. From time to time I also host giveaways, and followers of my Facebook page are eligible to use a special coupon code to gain discount from my Etsy shops (just send me a Facebook message asking for the code if you don't already have it). Check your "Get Notifications" settings now, and make sure you're receiving Facebook updates from me and your other friends and pages that matter to you! Figure 3: I love to make new friends on my personal profile too! To check you're getting updates from your friends, go click the "Friends" tab (next to the "Message" tab) on your friend's profile, and ensure "Get Notifications" is ticked in the drop down menu. You can use the same drop down menu to organise your friends and pages into lists. Simply click on "New List" and enter a name. Once you have set up your own lists, just click on "Add to Interest List" to add a friend or page to that list and ensure you never miss an update again. Simples! Just remember, if you want to see more Facebook updates, you need to set "Get Notifications" ON! Incidentally, Google also now determines site rankings based on the level of reader engagement, so the more we all interact and engage with each other on the various social network platforms such as Facebook, the higher the rankings Google gives our sites!